The Cisco WRVS4400N has been discontinued. No direct replacement is available. Complicated applications need a bigger network pipe for better performance. The WRVS4400N Gigabit Security Router offers next-generation Wireless-N speeds while maintaining compatibility with older devices. 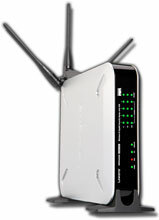 The router's "multiple-in, multiple-out" (MIMO) technology extends its range and performance. The WRVS4400N incorporates advanced security including an optional security service helps block malicious websites and control web access. Offsite workers can access your network through a secure and easy-to-use virtual private network (VPN) connection.